Should I worry about that crack in the wall? Few things put the fear into potential buyers like cracks in the walls. If you’re on the hunt for a fixer-upper and you’ve told your real estate agent to show you everything from the “handyman special” and the “has potential” to the “great lot value teardown,” you might see something with cracks in the walls. Hairline Cracks in Walls: Not So Serious? Houses always move and normal movement sometimes causes very small cracks to appear. Not all movement is a sign of settlement. Some is more related to the weather. Temperature and humidity changes can cause building materials to expand and contract. Even in imperceptible increments, this can cause hairline cracks. Houses always move and normal movement sometimes causes very small cracks to appear. Not all movement is a sign of settlement. Some is more related to the weather. Whatever the cause, very tiny hairline cracks that follow the line of building materials are usually not cause for alarm. If you can “see” the crack but you can’t put anything IN the crack, not even the edge of a business card or the point of a pen, that’s often the kind of thing that just needs to be caulked and painted. 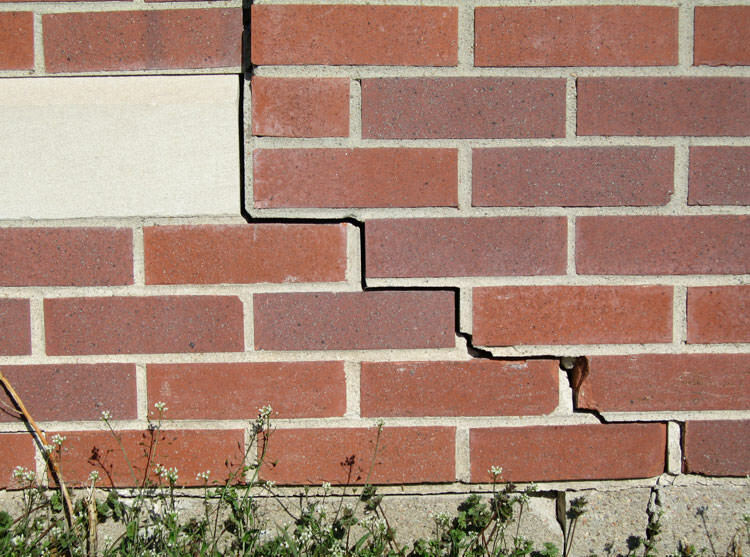 Common non-structural cracks often follow the line of the building materials. In a concrete block or brick wall, they will “stairstep” along the mortar joints. In a frame wall, they will follow the siding and trim lines. This, combined with the crack being mostly visual rather than open, is a sign of a relatively normal maintenance condition. On the other hand, there are those cracks in buildings that indicate a major problem. You usually know one when you see one. A severe structural crack is generally open, meaning you can put a business card — or an entire pencil — in it. If the crack is large enough for bugs or critters to crawl in and out of it, you’ve got a problem. It means that something designed to stay in one place has moved significantly. The job then is to find out why. Maybe a little bit of wood rot caused a piece of trim to come loose. Or maybe the foundation is failing. You need to know. Problem cracks often break through building materials. In the example of a concrete block wall, the previously mentioned “stairstep” crack is common, but if you see a crack that goes straight through a few blocks at some random direction that does not follow the line of the blocks, that means something is definitely not right. If you’re seeing cracks and still thinking about making an offer, do yourself a favor and hire a professional to come take a look. If you’re seeing what appears to be the more common type of cracks I first described, you can point them out to your home inspector during the whole-house inspection. If a licensed inspector says it’s no big deal, then it most likely isn’t. If you’re seeing those more severe cracks, on the other hand, I suggest you seek the advice of a structural engineer. Note: Not everyone with a contractor’s license is qualified to evaluate these things, and a damaged foundation could be a sign of a major “money-pit” property. A qualified evaluation is worth the money. I bet I could walk up to any house more than a few months old and find at least one crack somewhere. That’s just what happens to building materials exposed to the weather. Often the crack is no deeper than the paint and 90 percent of them are nothing to worry about. But there are some that you should run from. If you don’t know the difference, hire someone who does before you sign a contract! Next: JUST MARRIED: What name should I use when looking for our first home?